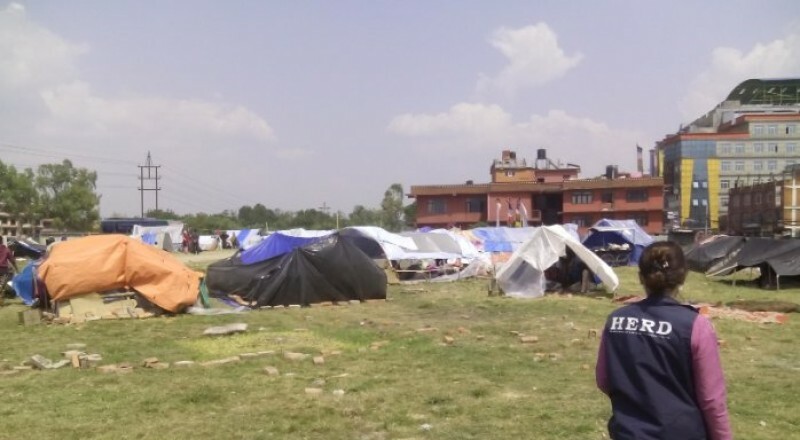 Even though the government, various humanitarian agencies as well as foreign countries have been distributing relief aids in different parts of the country, victims are awaiting support even at the capital city Kathmandu. More than 100 people have been sleeping under torn tents at the field beside the Pasang Lamhu Sherpa’s statue in Jorpati. Most of their houses outside the valley have collapsed, depriving them of shelter inside the valley. Various organizations have visited the camp and provided tents, water as well as food. A house nearby had allowed all the victims to use their toilet which made it easier for them. They have been cleaning the area so that no outbreak occurs. An Indian medical team had visited the camp and provided basic medical service. The camp includes numerous elderly citizens, children as well as few pregnant women. The children have started getting common cold and have been complaining of chest pain. Some locals have complained of diarrhoea cases though the prevalence is low. Raj Bahadur Chhetry, 77- We have been staying at the open field since last 13 days. All the money I had has finished and I am still unable to take my belongings from the rented room at Chucchepati. For few days following the earthquake we managed the food from that money. Now that we don’t have money left we are relying on the relief providers. The team from the Gurudwara (religious site of Sikhs) has been providing food twice a day since Tuesday. “We don’t know till when they will feed us. The food has helped us fill our stomach now but we don’t know how we will manage later”, he said. Ram Kumar Shrestha, 35- My wife is eight months pregnant and I have a five years old son. As our rented room had cracked we were forced to spend the night at the camp. But slowly both of them started showing health problem. Fearing that their health will worsen, I took them to my brother’s rented room at Anamnagar. “We didn’t receive any health service from the government, it would have been better if the government provided some relief at least to pregnant women and children”, he said. Maina Kumari Rana Magar, 55- I started having diarrhoea since Tuesday night. As there was no free health service available nearby, I went to go the nearest pharmacy and got medicine. She said, “We are having a tough time managing as we don’t have money left. The government could not provide even basic health service, what else can we expect”.